A great performance does not automatically mean a great movie. 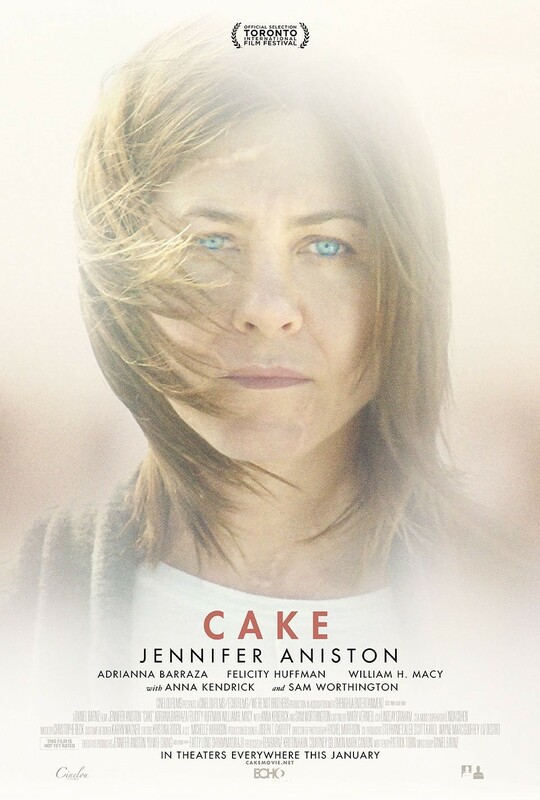 Jennifer Aniston is great in Cake. She successfully portrays a woman with chronic back pain who has lost her life before her accident, is slowly self-destructing, both mentally and with the relationships around her, and is contemplating suicide. It is a very heavy role and Aniston handles it very well. The issue is how the movie around her handles it. Cake needed to be one of two things, a very tragic, heavier and more focused drama or very black comedy. Aniston’s role is very good but she isn’t really delivering anything we haven’t seen many times before. She is the broken, foul-mouthed, harsh tempered loner who speaks her mind regardless of the consequences. Unfortunately, that has been done and much better. This movie needs to either focus on the rebuilding of Aniston’s character with a very raw movie around her or have her interactions, actions and general demeanour be funnier. Not slapstick or gag a minute but just have her say things you wouldn’t expect, rather than existing in a quite pedestrian movie. The problem Cake has is that it isn’t anything that hasn’t been seen many times before already. The film isn’t offering anything new and is most definitely not packaging the movie it is in any unique, extreme or memorable way. The film is good, just not incredible and it is a shame because Aniston’s performance warrants a better film. There is promise. The relationship with her maid/housekeeper is a great one and the two-hander between Aniston and Adriana Barraza are some of the best scenes. The movie could focus more on this relationship. The same relationship between Aniston and recently widowed Sam Worthington has some potential but feels shallow and easily resolved. There are even hints at a bigger, more complicated movie, with a sorely under-used William H Macy which almost makes you wonder what had been cut and the sudden appearance of a runaway played by Tommorrowland’s Britt Robertson, offers another movie but is again, largely left to fade away. There are at least three to four potential films which would have worked a lot better or at least been more unique but instead we are left with Aniston’s character being slightly irritating to many different people while she struggles to get her life back on track. Overall, Cake feels like it is missing something. It certainly isn’t the excellent performance from Jennifer Aniston but probably some sort of spark in story itself. A much crueller, harsher Aniston or a drama which really pulls no punches would work much better than the quite average, pedestrian drama which doesn’t warrant the performance that Aniston offers.